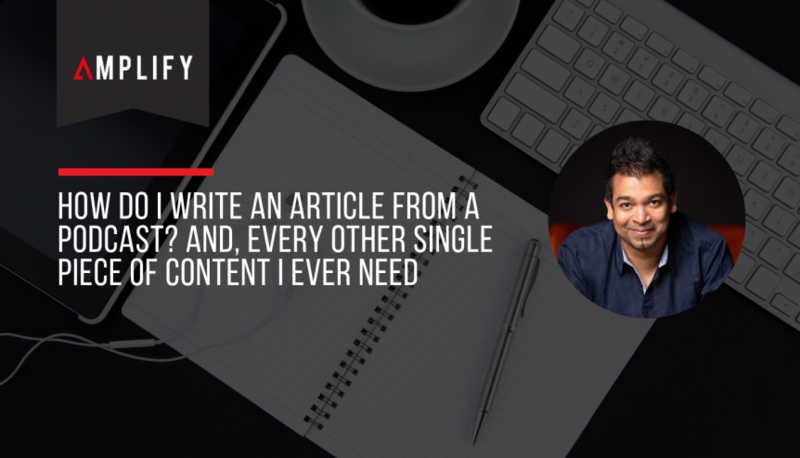 Content How Do I Write an Article from a Podcast? And, Every Other Single Piece of Content I Ever Need. How Do I Write an Article from a Podcast? And, Every Other Single Piece of Content I Ever Need. I get asked this question so often and I suppose the best way to explain it is to show you an example of what I've done with an episode. This is how you can take any piece of audio and create all the content collateral you'll ever need. From articles, to social messaging, to slide decks. Every single week! Whether you’ve interviewed someone, someone's interviewed you, or you’ve just captured a monologue, this is what you need to do next: Reverse engineer the audio that you've created. What do I mean by reverse engineering? You need to collect a bunch of information from the audio that you've created. I'm going to give you a framework so you understand exactly what I'm trying to say. And I’m going use episode 35 of Should I Start A Podcast to help illustrate some of the information I’m trying to extract. To listen to that episode, go to wearepodcast.com/035. Omar has fourteen years of business building experience. Nicole is a New York Film Academy graduate. The $100 MBA gets over 50,000 listeners per day. The $100 MBA podcast and how they make it happen seven times a week. How they recorded, edited and produced their first 300 episodes by themselves. The difficulty in doing a daily show in terms of quality, content and consistency. The reasons behind their success. The fundamentals of business – the whole purpose of the $100 MBA show. How podcasting has changed their business. The launching of the $100 MBA online training and community. How podcasting can build long-term relationships. The importance of competitions in order to have a sustainable program. The money aspect of podcasting. When starting out with your podcast, it’s important to involve yourself with all areas of the show’s production. Always be careful to adjust your show as you grow. Your show always wants to be growing. Don’t be afraid to experiment with new ideas. Earn your audience’s trust by being entertaining and consistent with your content and output. Once you have a popular, growing show, you can begin thinking about monetising it. It’s important to podcast at least once a week. It’s important to be original with your content and the structure of your show. Ask yourself how your podcast is different. Make sure that any sponsors will appeal to your audience and fit in with your show’s ethos. If you’re not getting the number of listeners you’d like for your show, ask yourself what you’re missing and consider restructuring your podcast. Write down a list of three practical and actionable steps you could take to improve your podcast’s visibility. Are you consistent with the amount you podcast? If not, consider why and how you can change that. Perhaps you need to bring in external help. What are three key resources mentioned in the audio? This is self-explanatory – what resources have you directed your listeners’ attention to, whether it’s websites, books and/or videos? Take the top three action items and create three Facebook updates around them. Allow your team or a graphic designer to create an image that highlights the audio you’ve created. You can release one of these every week for the next three weeks. If you have a weekly show, then every week, you can tell your audience that there is a new audio episode out, but also that there are previous episodes that they could’ve missed. I wouldn’t release more than three Facebook updates a week. Take the top ten takeaways and three of the six top quotes, put them together and create thirteen Tweets that drive traffic to that piece of audio. Because the life of a tweet is so short, you can release a tweet every one to two hours through a scheduling program like Hootsuite, or Buffer. Then take all six quotes and make six Instagram images out of them. Canva (www.canva.com) is a great program to use for this. It’s online image creation software that lets you produce images that cater to a whole host of different platforms. Now create three Pinterest images, or use three of the same images you created previously for Instagram. You can create them around three of the quotes or around the action items. Next, take the six bits of content that you’ve created and put them together into a slide deck that you can upload to SlideShare. The more slides you create with smaller pieces of bite-sized information, the better for SlideShare. Create a brief live-stream video to announce the top ten subjects covered in your audio. If live video scares the bejesus out of you, then use the slide deck you’ve created in step 5, and create a screencast with you talking to each of the slides. Make your video less than four minutes and upload it to YouTube, even to Facebook if you wish. The last step is the written word. Create a blog post out of the six bits of content to complement your audio. If you can, get an ally to share the article on their platform; you get the advantage of reaching their audience too. Within all this, if you have an interview type show, and you haven’t emailed and kept in touch with the guests that have been on your show, then, as a business owner, you are shooting yourself in the foot. Relationships are key to any business functioning and the more you foster them, the quicker you are going to succeed. So now you have a variety of content leading to your audio that can be present on LinkedIn Pulse, Medium, Tumblr, Twitter, Pinterest, SlideShare, Facebook, Instagram, YouTube … every platform you please. If you liked this post and found it useful, please share it. This is so helpful, Ronsley. I started out my podcast, Charityconnectpodcast.com and writing the notes has been a challenge but I’m happy that with this article, I’m able to try my best. Cool Sola. Love that you found it helpful. Thanks for that great content Ronsley – I am setting up ‘Tales of Reinvention’ podcast at the moment and will feed content from there into my digital magazine, ‘Honestly Woman’, as well.